Milodon contoured louvered windage trays provide optimum protection against oil splash back, increase horsepower and permit rapid return of the oil to the sump. These trays are ideal for street and strip applications. Tests conducted on a 400 HP street engine fitted with a Milodon louvered tray added 15 HP! Milodon adjustable tray studs are required for proper installation on all Milodon windage trays. Stock tray bolts will cause the tray to interfere with the stock oil pan baffle, which will need modification. Using Milodon adjustable tray studs allows the correct height for maximum power to be set, regardless of stroke, steel or aluminium rods. Designed for Ford 429-460 using rear sump (1980 & up and earlier modified engines). 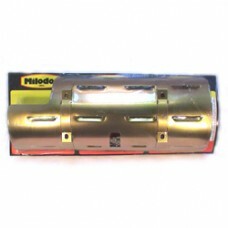 Use Milodon windage tray install studs MIL81190 for most applications.